A new table of the complete genetic code has been added as an appendix. Chris Gan (Highline Community College) joins Steve Sullivan (Bucks County Community College) as digital author on the 7th edition of Anatomy & Physiology. Beginning of chapter “Brushing Up” makes it clear why a student must know earlier concepts in order to understand a new chapter. APR 3.0 icons in the textbook to indicate the correlation to APR 3.0. Saladin's stunning visuals are paired with Anatomy & Physiology Ӏ Revealed's acclaimed cadaver dissection photos, animations, and histology images. “Assess Your Learning Outcomes” is written in an “indicative format” that doesn't paraphrase the chapter's main points but indicates what key points the student should get out of the chapter. Feature: “Testing Your Recall”, “True or False”, and “Testing Your Comprehension” all build on Bloom's Taxonomy to assess learning outcomes, test simple recall and analytical thought, and apply basic knowledge to new clinical problems and other situations. Feature: “Building Your Medical Vocabulary” tests the student's knowledge of medical word roots and affixes. This feature includes 300 of the most commonly used word elements in medical terminology. Exceptional writing. Saladin offers the reader accurate content that is presented at an appropriate level of detail for the beginning A&P student. The author incorporates clinical examples, real-life applications, and “try this yourself” activities to make the content interesting to the student, but does so in moderation to keep the discussion focused on the main ideas. Students are better able to understand the difficult information provided without being overloaded with extraneous details. Superior art program. Saladin raised the bar on art programs in A&P! Saladin's art program features the highest quality of realism, 3D appeal, accuracy, and clarity. Digital files of the entire art program are also available for use by instructors to allow complete flexibility for lecture presentations and assessment. Effective clinical coverage. Saladin uses clinical examples and essays to show students the relevance of the concepts they are learning to their future career. Some topics Saladin addresses include: medical imaging techniques, gene therapy, carpal tunnel syndrome, Alzheimer disease, AIDS, Viagra, and hypertension. All CONNECT assessments are assignable by learning outcomes (LOs) and by Human Anatomy & Physiology Society (HAPS) Los and include animation, interactive, classification, labeling, sequencing, and composition questions; all are tagged to Bloom's levels 1-5. APR 3.0 icons within e-book launch APR through CONNECT. SmartBook is an adaptive reading experience that transforms the way students read and retain knowledge. LearnSmart Labs is an adaptive virtual lab with outcomes-based lab simulations. LearnSmart Prep is an adaptive tool to help students prepare for college-level work, and includes a virtual tutor. Kenneth S. Saladin is Professor of Biology at Georgia College & State University in Milledgeville, Georgia, where he has taught since 1977. Ken teaches human anatomy and physiology, introductory medical physiology, histology, animal behavior, and natural history of the Galápagos Islands. He has also previously taught introductory biology, general zoology, sociobiology, parasitology, and biomedical etymology. Ken is a member of the Human Anatomy and Physiology Society, American Association of Anatomists, American Physiological Society, Society for Integrative and Comparative Biology, and American Association for the Advancement of Science. 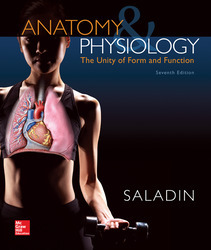 He is the author of the best-selling textbooks Anatomy & Physiology: The Unity of Form and Function and Human Anatomy. Ken and his wife Diane have two adult children.